Çok teşekkürler! Thank you! Merci! 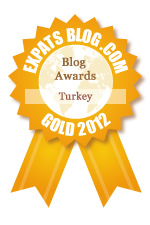 Thanks to everyone's brilliant, incredible comments, My Turkish Joys, won gold in the Expat Blog Awards 2012 competition for Turkey! I just found out the news around 10 p.m. last night. I'm overwhelmed and simply thankful for everyone's support. My gold button is now proudly displayed on the left-hand side of the page. I started this blog to keep in touch with friends and family back home, but it's become so much more than that. My Turkish Joys has become an online diary of sorts about my life here in Turkey and our travels. I love sharing about our adventures and mis-adventures, and I'm happy to hear that you enjoy reading about them! Who knows what the new year 2013 will hold? Very well deserved - Congratulatons. @Claudia,thanks so much! Of course, I love reading your fantastic recipes on your blog too. way to go joy! and you deserve it!!! Congratulations Joy, this is a great motivational boost! My names Mike and I've been reading your blog for more than a year. I'm from Michigan, and I found your blog when I was engaged to my (now) wife, who is a Turk. Its been comforting to read about your positive experiences in the city. I've now been living in Istanbul for 6 months, and I've used your suggestions a number of times. For example, I've visited the baking shops you've recommended in Eminonu, and without your post it would have difficult to know how to prepare 'Turkish' beans for this Thanksgiving's green bean casserole. @Mike, thanks for leaving such a nice comment here! Happy to be of some help! I popped over to your blog too and it looks like you are certainly adjusting to your new life over here too. Cheers!